Linnet in Oriel: Hidden Mother: Imagining the Past. This blog is supposed to be a little bit of this and a wee bit of that, books, cooking, a bit of craft nothing too taxing or controversial but I am beginning to understand that the process of writing sometimes is not that agreeable to self-bound perimeters. Sometimes subjects collide in such a way that they crowd other thoughts and will not go away almost like the residue of a half-forgotten dream that invades the rest of the day. But to begin to write it out; I have to retreat a little into digression. I am a self-confessed vintage and antique junkie, there is nothing I like better than a dusty old junk shop, charity shop or even over-priced high end retail establishment dealing in exquisite Georgian furniture that I could never afford much less fit into my little 1930's dolls house. I love vintage French linens, 17th century glass and pottery, Victorian jewellery, hand-turned treen, mid century Danish design, 1950's kitchenalia. I get a little bit silly over vintage clothes, Victorian to Mod, it doesn't really matter just as long as it is a little bit atmospheric. Or probably as someone said (only a little disparagingly) just as long as it has belonged to a dead person. Occasionally a new fetish befalls me, lately I am fascinated by those 1960's tourist scarfs, my favourite is this one from Panama. One day, when I learn to machine sew it is going to be a big squashy cushion on my swing seat. Holding it in my hand I feel connected to another age, one of glamour, long long sea journeys and perhaps a brief encounter. However there is a down side of the acquisitive collector -apart from the financial-it is the story of regret of 'the one that got away' the 'if only I had bought that' piece. I have two such pieces that occasionally pop back into my head and I sigh and have to console myself with a frustratingly unsuccessful (re) search on eBay. One was a Victorian mirror, it was framed in pewter-coloured iron and bedecked with such a perfusion of climbing cherubs, vines and flowers it was a perfect riot of over-the-top-ness. It was for sale in a little shop in South London, it was heartbreakingly inexpensive but back-creakingly heavy. My lifestyle was unfortunately peripatetic in those days for such a weighty addition. The other was also a Victorian piece, a large beautifully framed portrait of a baby, and what a gorgeous, chubby cheeked child it was. Sweetly dimpled, it smiled right out from it's smooth rose-wood and gilt frame. I have no real idea why this piece continues to fascinate me. I was outbid which was annoying I suppose and I am attracted to the idea of living in a house with a history and filled with ordinary domestic objects with a past, not necessarily my own historical narrative. it is also fascinating to conjecture why this portrait had become detached from its own familial narrative. 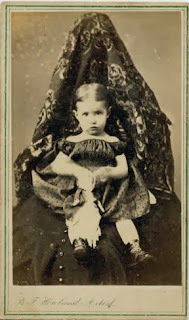 Then while 'searching' for a similar portrait, I happened to stumble across some 'hidden-mother' photography. Divested of their contextualizing and literal frames, these images are strange and other worldly, alien and un-readable. Usually they are written about in connection with that other artistic anachronism, the Victorian post-mortem. However, the explanation for these images is quite mundane and common-sensorial. The obscuring of the 'mother' was down to a desire to capture only the image of the child and to hold them still for the exposure times. Nevertheless, there is some quality about these photos that really fascinate me so I am so excited about Linda Fregni Nagler's new book 'The Hidden Mother', which is reviewed in today's Guardian. Thank goodness for Christmas coming up. Occasionally, I worry that all this desire to construct an atmosphere of nostalgia is somehow linked to my own very real and occasionally still raw disconnection from a part of the fabric of familial relationships. At the weekend my daughter was compiling a list of all her family members (we are part of a very big and blended family) and asked me if she could add at particular name, my mothers name. I have not seen her for twenty -two years. For twenty of those years I have attempted to remain pragmatic about this situation and sought to build my own family and forge my own connections and have not really had time consider the absence of this relationship. But E is now at the age of hard to answer questions and so my mother is slowly becoming more present in our family life simply because of this absence. 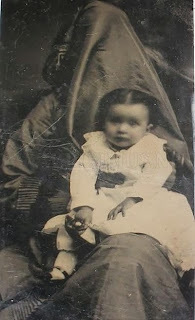 She is becoming like the ghostly figures in the photographs, a hidden mother, present but without an appropriate frame. hello there, just found your blog via bobobun...I like those scarves too I have a New york one and it still has the twin towers!